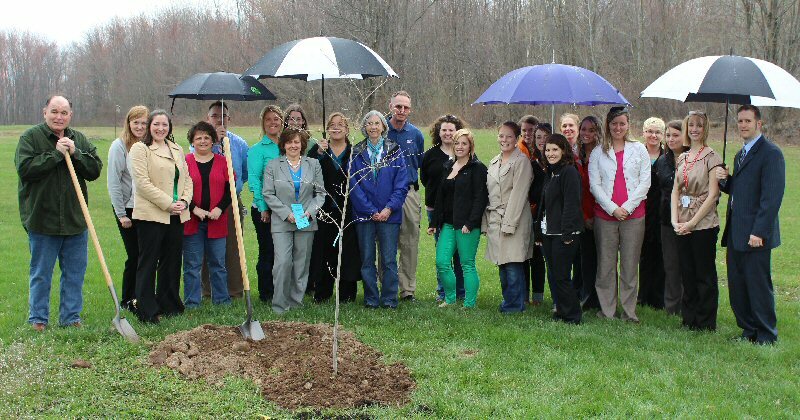 HANNIBAL, NY – Even a little rain couldn’t keep members of SAF (Services to Aid Families) and the community from the 12th Victim’s Rights Tree Planting Ceremony recently. Every year, the ceremony takes place in a different community in Oswego County. This year’s tree was planted outside the Hannibal Town Hall. 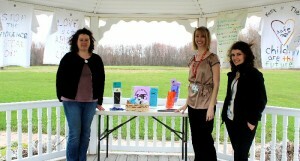 “Our intention is to have a tree in every of the 22 cities and townships and villages of Oswego County, so we have a decade to go,” said Meredith Needham, SAF Education Program Manager, who helped coordinate the event. The theme calls on people to look back on the history of victim’s rights advocacy, and also to the future of aiding individuals and families affected by crime, and crime prevention. The tree represents a space in each community that shows support to victims of crimes, and represents renewal and hope. “It has a lot to do with a tree’s lifecycle. In spring there’s always renewal and rebirth and life, and it’s an interesting symbol to the experience of crime victims,” said Needham. “I believe we need to get the message out to the community about crime victims’ rights and that we won’t tolerate abuse,” said Bob Lighthall, a member of the SAF Committee. The tree was planted by Needham with the help of Hannibal Mayor Fred Kent, and Hannibal Supervisor Ron Greenleaf. Also in attendance at the event were Hannibal School District Superintendent Donna Fountain, representatives from Dan Maffei’s office, SAF educators and counselors, and SAF Advisory Committee members. 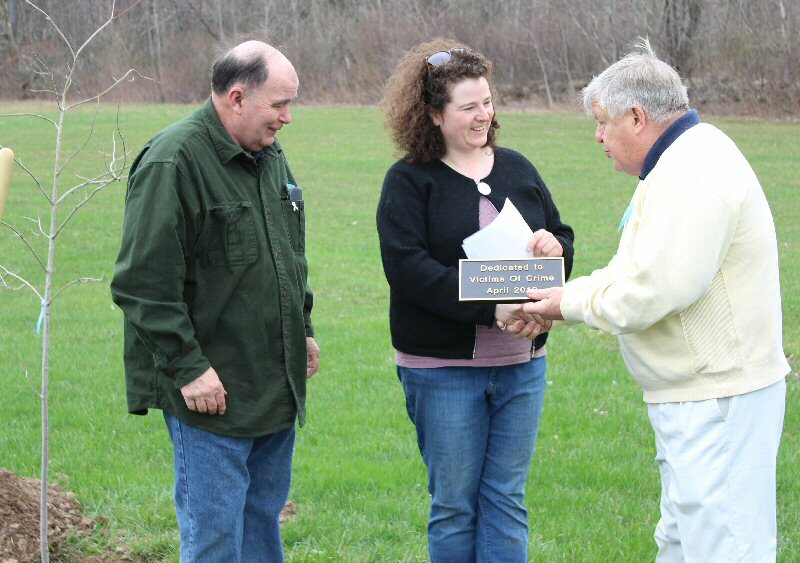 The mayor was presented with a plaque designating the young maple as the tree planted in honor of 2013 National Crime Victim’s Rights Week. “It’s amazingly fitting we got a maple tree this year,” Needham noted. “The maple tree has traditionally symbolized balance, promise, and practicality.” These are all values SAF aims to give back to victims of crimes.